With Easter right around the corner, it is the perfect time to think about various decorations that we can buy so that our home will look great for the holidays. We understand the fact that there are many sites that currently sell Easter decorations. It is quite difficult to make a list of those that we really like. In thinking about the options that we highlight below, we thought about coming up with different sites that offer out-of-the box Easter Decorations. We did not focus on those that are common and that can be found practically everywhere. We do believe that you want to have a home that looks as different as possible and as personal as you can make it. The first thing that will stand out for many is the price tag. Most of the items that are presented here are priced between $5 and $20. It is a guarantee that you can find something that is really cute and that would add color and joy to your home. While many of the decorations in the past year were classic, now we have many other elements that are interesting and the bunny rabbit is no longer the only center of attention, although it is always present in online shops. If you want some color in your home this Easter and you do not want to spend too much money, take a look at the Terry’s Village offer HERE. We do not regularly look at Walmart when buying decorations of any kind but we have to admit that this year they actually came up with a cute selection of Easter decorations. You have access to useful categories to help you find items that you may like from Jewelry to Décor. As you surely realized already, the prices are not at all really high. After all, we are referring to Walmart. Check out the Easter decorations HERE. Check out everything that you find HERE, especially if you consider the kitchen as being one of the most important rooms of the home and you also love cooking. Maybe this Easter you might want to consider buying different decorations that are related to food. In this case, this is the best selection of products that we saw till now. Various items are available from Easter gifts to candy and we all love candy, right. This is definitely not a shop but it is also a resource that you need to check out if you are looking for Easter decorations. As you may already know, the focus is put on DYI projects. Many wonderful decorations are showcased and you can even find some great projects for kids. We all know that they get bored fast so this might be something you will like. Check out the selection HERE. 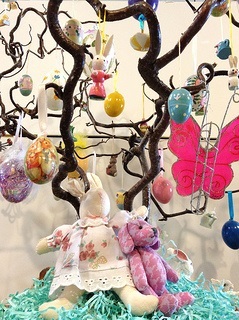 Do you want to recommend other stores that offer Easter decorations you like a lot? Do so in the comment section. The Losi Lure: Does the Brand Name Matter when Buying Radio Control Cars? Are Timber Bench Tops Right For Your Kitchen?